By many accounts, the city of Chicago is the birthplace of Gospel music. Being rich in music heritage, the city has played host to some of the industry's largest events and is home to the genre's most notable names. It's no surprise that the city would play host to one of the industry's next fresh faces, as Syreeta Thompson held her debut live recording in the Windy City on July 11, 2009. Held at Destiny Worship Center, a packed house was treated to the musical expertise of Thompson who is by no means an average artist. Thompson, known throughout many circles as "The Trumpet Lady", fills a unique void in the industry as a female brass instrumentalist. Thompson's musical pedigree is impressive holding a Bachelor of Music degree from Rutgers University and her Masters of Music degree in Filmscoring/Jazz Composition and Arranging from New York University. In addition, Thompson has worked with the likes of Beyonce, Hezekiah Walker & LFC, and Dorinda Clark-Cole. All of this set the ground work for a musical evening to remember. The evening kicked off with praise & worship led by BET Sunday Best Season 2 finalist Maurice Griffin, who performed several original songs and alluded to the release of a solo album in 2010. Griffin's top-notch performance reminded everyone the immense talent found in this year's Sunday Best crop of singers. The evening's host was Love Fellowship Tabernacle director Mark Anthony Henry, who prepared the crowd for the evening's event. Shortly thereafter, Elder DeAndre Patterson, pastor of Destiny Worship Center and accomplished gospel artist, greeted the crowd and shared several impromptu a capella hymns that prepared the masses for Sunday morning church!! After a video presentation, Grammy & Stellar award winner Dorinda Clark-Cole took the stage to introduce Syreeta Thompson. Thompson took the stage in a red dress and matching trumpet, which is rare to see these days. Backed by a highly-skilled four piece band and background singers, Thompson was ready to roll and kicked off the party with a mid-tempo praise piece titled "Give Him Glory". 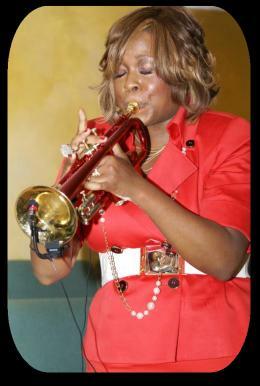 She followed with "God's Grace" that saw her handle lead with both her trumpet and her vocals. Following this piece, she shared her testimony of how she was diagnosed with ADHD and wasn't initially accepted into graduate school but how God's grace changed things for her. This led the crowd into a serious dance reminiscent of a hot Sunday morning worship service. As a member of Bishop Hezekiah Walker's Love Fellowship Tabernacle, it was quick to see that "The Ma-Shonda" was in full effect as Thompson danced in heels with her trumpet in hand without missing a beat. That set the tone for the entire recording which was filled with anointed and well-written music. Check out the exclusive pictoral recap (photo credit: Gerard Bonner). DeWayne Woods took the stage to add his lead vocals to "Make A Way", an incredible song about God's amazing ability to bring victory from the jaws of defeat. Needless to say, the combination of Woods with Thompson's writing was another musical match made in Heaven. The first half of the recording ended with the amazing song "In His Presence". This song perhaps best embodied Thompson's arranging ability as the mid-tempo urban jazz groove grabbed the audience and never released them. The song was so infectious that Dorinda Clark-Cole took the mic going into the intermission and gave an impromptu reprise that was simply incredible. The second half of the program picked up where the first half left off, filled with amazing energy. Thompson offered her New Orleans-tinged presentation of "Bless That Wonderful Name" which took the crowd into a frenzy. It became a challenge to end the song, so everyone danced and partied Mardi Gras style. That quickly led into another high praise as Thompson taught the audience about the Sound of the Shofar used in the days of the Temple. She then moved into an a capella solo set that featured "To God Be The Glory", "The Lord's Prayer", and "Bless the Lord". 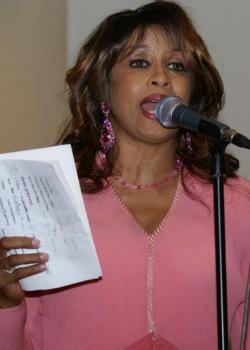 The recording ended with the live version of "Victory", a song from her debut CD, Gabriel's Praise. While an album release date is still to be determined, this recording was definitely a moment in history and will definitely be an album worth rushing to the stores to purchase. Until then, enjoy the exclusive pictorial recap housed here at GOSPELflava.com.